Visa For Music Conference returns November 21st-25th in Rabat Morocco. A bountiful selection of Arabic and African artists curated by a pan African jury of cultural professionals will grace four stages in two venues in the heart of the city. In its 5th year, this arts showcase is fast becoming a must for curators from around the world, while creating a gateway to international audiences for regional artists. Fans of the music are welcomed as well, all events are open to the public and free of charge. In addition to the stage shows there will be afternoon conferences, documentary projections, speed-meetings, workshops and training. Last year 1093 artists performed 185 showcases a whirlwind snapshot of who is catching ears on the continent from Gqom out of Durban to Persian Sufi maghams. 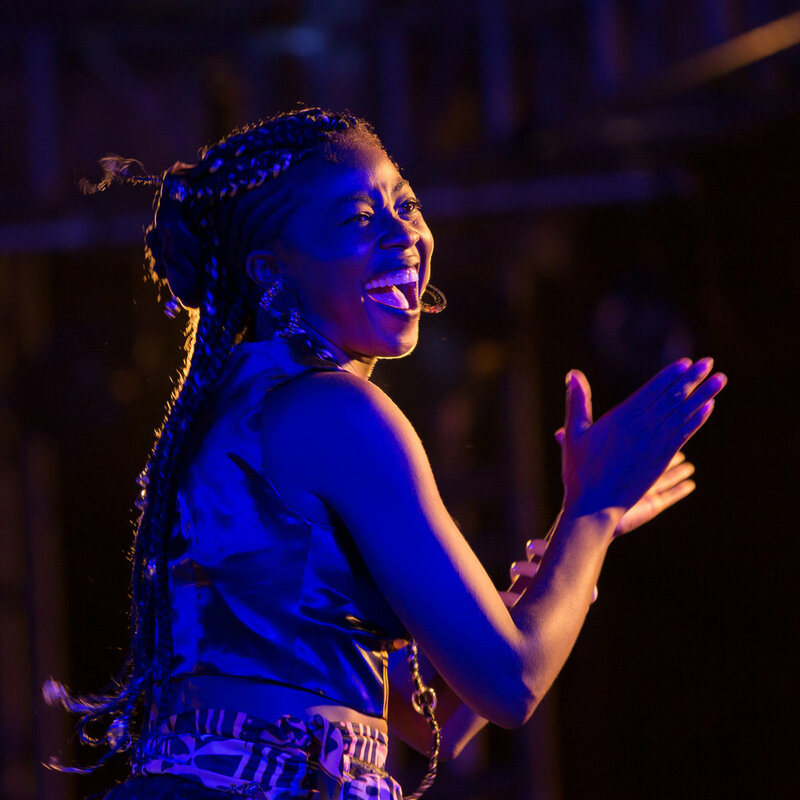 Lornoar's talent as a dancer shines alongside her music, songs that seamlessly meld Cameroonian makossa, even bikutsi with jazz. Her songs sung in the Eton tongue take on themes of violence against women or intolerance as well as abandonment and jealousy. 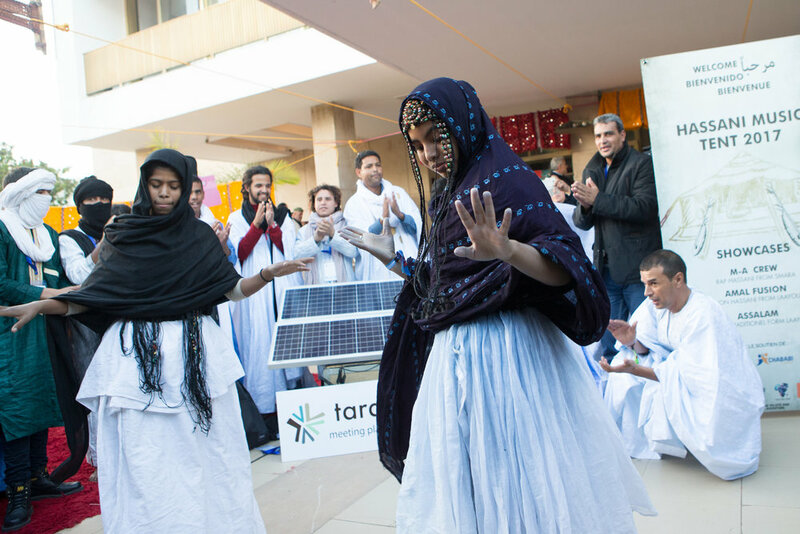 Performing will be Lornoar (Cameroon), Ifriqya Spirit (Algeria); Hamza Said Chraibi (Morocco); Gwen and Tiana (Gabon/Paris); Mehdi Qamoum (Morocco); Asma Hamzaoui (Morocco); Mamadou Diabate (Burkina Faso); Thee Legacy (South Africa) Shayfeen (Morocco); Tania Saleh (Lebanon); Nabyla Maan (Morocco); Sharmoofers (Egypt); Lucibela (Cape Verde); Kommanda Obs (Lesotho) and Mr ID (Morocco) with more selections to follow. The intercultural dialogue was in evidence opening night when JouvayFest, a Trinidadian carnival group based in Brooklyn paraded down Mohammed 5 Avenue, sweeping up locals in a gust of creative chaos. The group consisted of over 30 members including drummers from Bacchanal Rhythm, Village Drums of Freedom, Brooklyn Steel Orchestra, and costumed traditional characters from Something Positive Dance and the Pagwah jouvert band. A spontaneous meeting led to more magic when a young singer from Senegal was invited to join Iranian master Ali Asghar Rahimi to sing Persian classical song, a never before attempted feat which she pulled off with with flying colors. Persian classical musician Ali Asghar Rahimi and West Africa vocalist Stella Aïcha Sagnon, met by chance the evening before Mr. Asghar Rahimi’s set at the Renaissance Theater. Mr Asghar Rahimi says of his music “My music is spiritual / sufi. I usually play and sing Maghams composed on the mystical poems of Jalaludin Rumi. (with his group Roohafza). Brahim El Mazned, Director For Visa For Music and Moroccan rap music producer X-One, saturday, November 25th at the 2017 marketplace. Choosing between stages forced some difficult decisions, so it pays to research options and plan your night. Many artists are exploring identity by acknowledging or incorporating local traditions filtered through a contemporary sensibility. Queen Koumbof Gabon performing at the 2017 Visa For Music edetion. Click on the photo for a photo gallery of performances. Lricist Kommanda Obbs of Lesotho will bring a hard hitting lyricist style he pioneered known as T’seppe, blending rap and sesotho traditions. Thee Legacy, from Durban, SouthAfrica, their music carries forward the Zulu all male choir (Isicathamiya) vocal tradition found in KwaZulu Natal. Ifrika Spirit touches on the eclectic sounds of gnawa, trance from within Algerian Diwan traditions as well as pschedelic funk. Egyptian reggae from popular duo Sharmoofers (Ahmed Bahaa & Mohamed El Arkan). Paris based Cameroonian/Gabonese Afro-jazz and soul duo Gwen and Tiana will perform at the 5th edition as will Lornoar a Cameroonian vocalist. 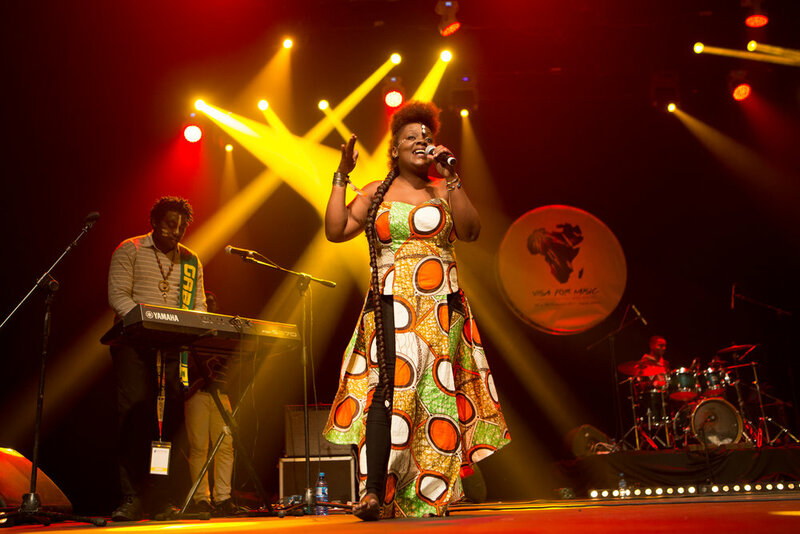 Visa For Music has as first goal to highlight the artistic creation of Africa and the Middle-East. This project was born from a paradox: on the one hand, the lack of visibility for African and Middle-Eastern artists at an international level and, on the other hand, a very important artistic dynamism and musical creation from these musicians. 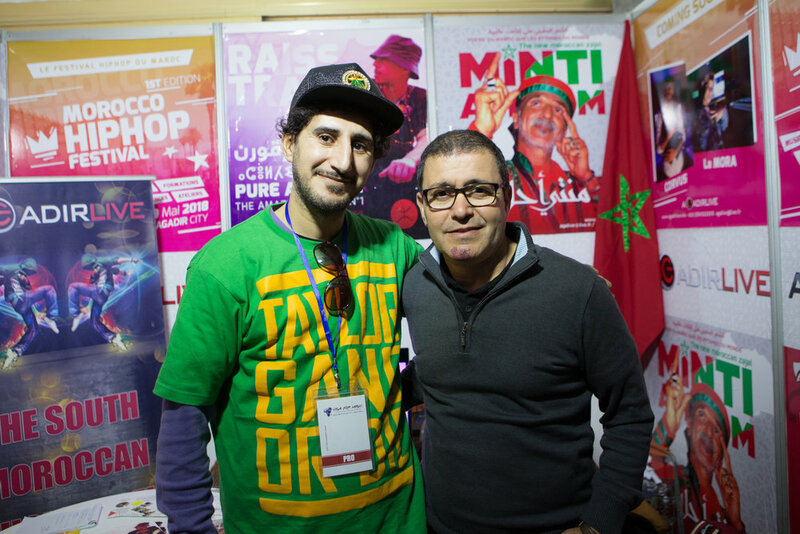 Director Brahim El Mazned says the event now in its 5th year is evolving each year taking a fresh look at artists from Morocco’s multicultural music scene, and emerging artists and established artists from the continent and beyond. Surprise and delight spread across faces during evening rush, many commuters joined the cacophony as it moved down Mohammed 5 Avenue through the center of town. For the performers it was a special moment also, coming full circle with their roots and for some a first visit to the African continent. Drummer Ras Jomo said “It was amazing to see the people come to the spirit of the drum, the people here will see what we are doing(in the Caribbean) and that connection which is the drum”. It was thought to be the first jouvert parade on the African continent. The band also performed daily outside the Mohammed 5 theater. Trinidadian Solo steel pan artist Michael Olivier shows some off some dance moves for some new friend the folk musicians from Tamnougalt in Morocco who clap time for him at the marketplace of the 2017 Visa For Music conference and showcase. Another unscripted moment that captured the vision of Visa For Music came during an afternoon visit to the marketplace where we happened upon solo steel pannist Michael Olivier showing a singer from Folklore Tamnougalt booth his instrument. The lesson quickly became a jam session with hand clapping and dancing accompanying the steel drum. Before it was over there was talk of a collaboration. 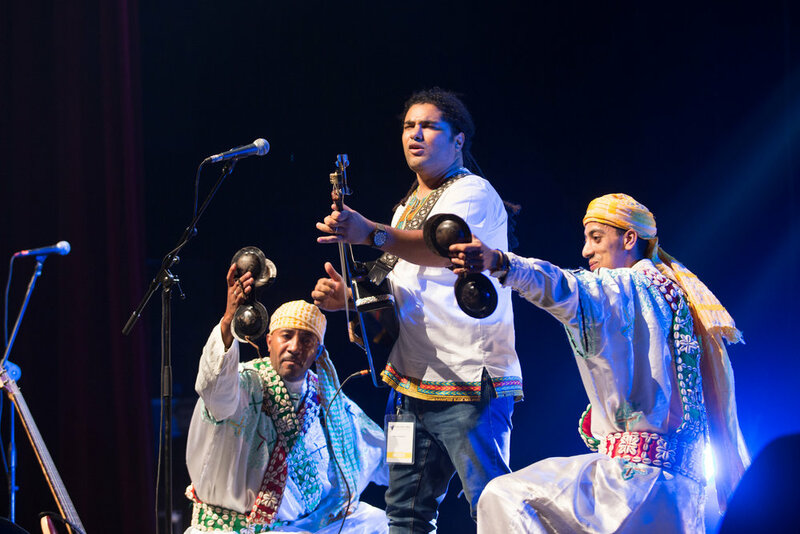 (L-R) Rajery of Madagascar on valiha, performing in the 3MA string trio along with Driss Maloumi of Morocco on oud, and Ballaké Sissoko of Mali on kora at the 2017 Visa For Music festival. 3MA willbe in New York March 15th at City Winery. Click on the photo to continue the photo gallery of performances. 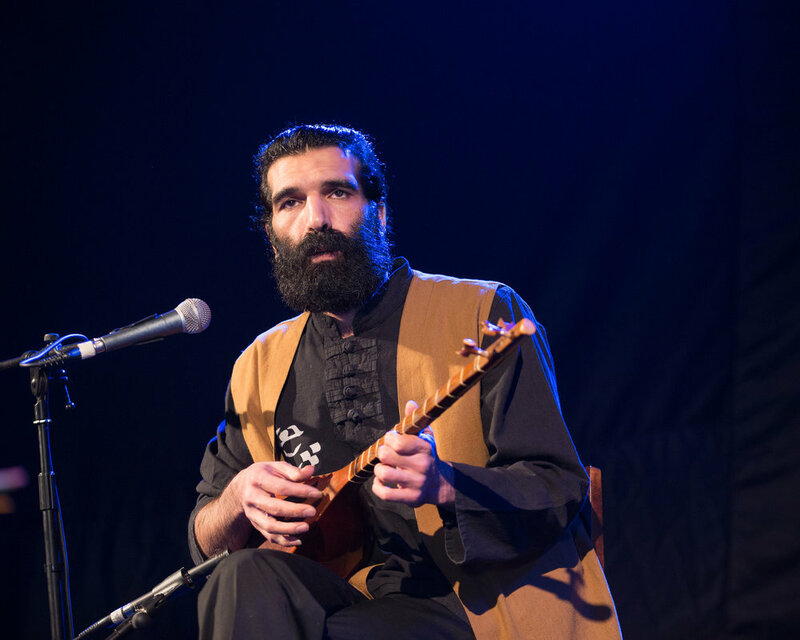 Among the 2018 participants are Moroccan Hamza Said Chraibi who follows in the footsteps of his father a famous oriental lute player, however his repertoire leans toward gypsy jazz, flamenco, and bossa nova accompanied by accompanied by Mehdi Rayoud and Karam Lefhiyel on guitar and percussion. Asmaâ Hamzaoui, with her all female band, Bnat Timboktou. Schooled in guembri and gnawa traditions by her father, maalem Rachid Hamzaoui, Asmaâ steps from his shadow with a modern style featuring her soothing vocal style and lush call and response vocals with the qraqeb musicans. Historically Morocco has been a somewhat contentious gateway between Europe, the Middle East and Africa.The architecture of the medina and the Roman ruins of the Chellah attest. Today it is ideally situated for creative interaction between cultures, and Visa For Music is doing that. Rabat as a destination has much to offer a visitor, from the 1000 year old Roman ruins of the Chellah, the medieval walled Kasbah overlooking the bouregreg, the Hassan Tower or the sprawling Medina, all in close proximity. So, if cultural travel is an interest mark November 21st-25th 2018 on your calendar.